Graphic design ‘To North Queensland by rail: the land of magic’ by William Bustard for back cover of Beautiful Queensland: land of variety and the holiday-maker's happy hunting ground, Brisbane Government Printer, 1926. Collection of the Centre for the Government of Queensland. Graphic design 'Beautiful Queensland from a railway carriage window' by William Bustard for front cover of Beautiful Queensland: land of variety and the holiday-maker's happy hunting ground, Brisbane Government Printer, 1926. Collection of the Centre for the Government of Queensland. The Sunlander train bound for Cairns at the Townsville Railway Station, 1972. Slide by Ruth Read, Collection of the Centre for the Government of Queensland. The Ipswich to Bowen Hills 8.30 am express train with diesel engine and wooden carriages arrives at Chelmer Station, Brisbane in 1972. 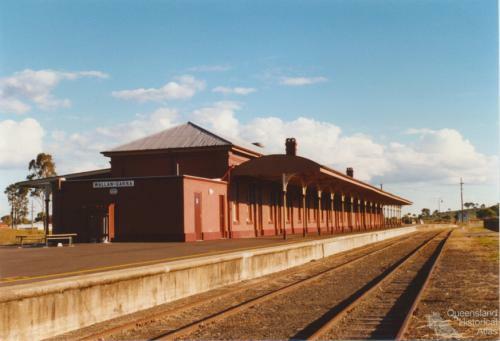 Electrification of the Brisbane suburban train network began in 1979, with the last diesel passenger train running in 1999. Slide by Laurel Murdoch, Collection of the Centre for the Government of Queensland. The 8.30am express train from Ipswich to Bowen Hills arrives at the Brisbane southern suburb Chelmer Station in 1972. The train has a diesel engine and wooden carriages. Slide by Laurel Murdoch, Collection of the Centre for the Government of Queensland. 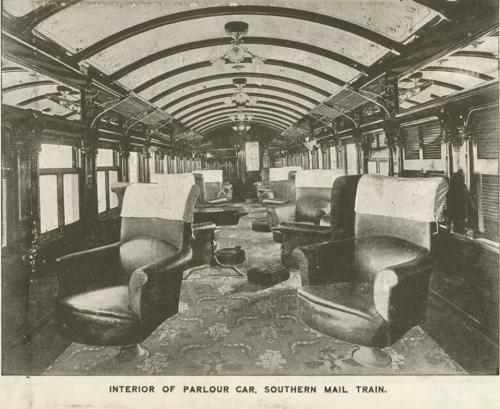 Interior of the parlour car of the Southern Mail train. 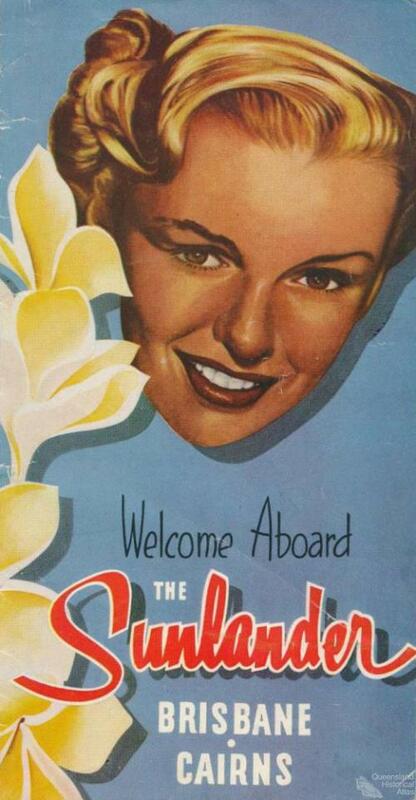 First Class passengers could reserve the chairs in the parlour car for five shillings. Advertisement from Queensland Railways, Hand book, 1912. Collection of the Centre for the Government of Queensland.